Venetian painter of religious subjects and portraits. Catena was a man of good birth and independent means who moved in humanist circles and may have been the link between these circles and Giorgione. 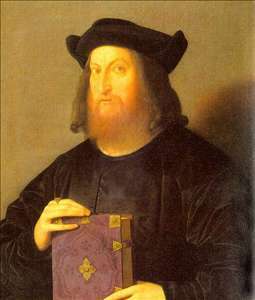 He is first mentioned in 1506 in an inscription on the back of Giorgione s portrait Laura (Kunsthistorisches Museum, Vienna), according to which they had entered into some kind of partnership. Nothing else is known of this arrangement. The main influence on his style was Giovanni Bellini. His early paintings can be awkward and stiff, but from c. 1510 his work matured under the influence of the late Bellini, Cima, and Titian into a style that was derivative but handsome, with pleasing handling of diffused light and warm colours. See more details about "Giangiorgio Trissino"